Michael Leonhart made his auspicious debut as a 21-year-old trumpeter and conceptualist who put a premium on space in his striking compositions for 1995’s enigmatic Aardvark Poses. He opened his multi-instrumental toolbox on 1998’s cinematic-sounding Glub Club, Vol. 11, then put his personal spin on tunes by Monk, Miles, Ellington and Harold Arlen on 2002’s intimate duet project, Slow. He took a major leap forward as an arranger-conductor for Nels Cline’s 2016 Blue Note debut, Lovers. Now, he delivers something even more ambitious with his own sprawling Michael Leonhart Orchestra. Inspired by the butterfly of the same name and its intergenerational 9,000-mile migration, The Painted Lady Suite comprises seven movements representing the changing climate and mood throughout the epic trip. The orchestra tracks the path of the butterfly from the evocative opener, “Transformation In The Deserts of Mexico,” sparked by an intense Donny McCaslin tenor solo, to the grandiose “The Silent Swarm Over El Paso,” underscored by driving percussion and colored by vocal choir, strings, bass harmonica and Cline’s reverb-soaked surf guitar. The fluttering, ambient sound clouds of “The Experimental Forest, North Dakota” further illustrate the journey. The 12/8-fueled “Countdown To Saskatchewan” injects unconventional elements into Leonhart’s mellotron motif and his Jon Hassell-ish harmonizer-effected trumpet solo, while “The Arctic Circle” melds Martin Denny’s exotica with Ennio Morricone’s spaghetti Western soundtracks. And the punchy “1,500 Feet Above the Sahara (Day)” recalls some of Sam Spence’s classic gridiron scores for NFL Films during the 1970s. Three extra compositions—the march-like “In The Kingdom Of M.Q.” (featuring another heroic McCaslin solo), “Music Your Grandparents Would Like” (featuring a fuzz-laden guitar freak-out from Cline) and the trance-like “The Girl From Udaipur”—fill out the conceptually rich, distinctive program. 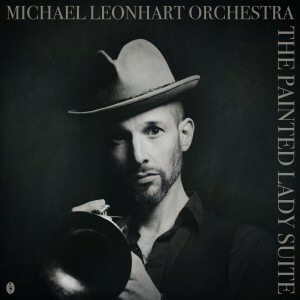 Personnel: Michael Leonhart, trumpet, French horn, mellophonium, bass trumpet, vocals, bass, organ, mellotron, accordion, bass harmonica, bass melodica, pump organ; Daniel Freedman, drums (1, 8, 9,10); Nick Movshon, drums (2), electric bass (5, 7); Homer Steinweiss, drums (5, 7); Jay Leonhart, bass (1, 8, 10); Joe Martin, bass (6, 9); Nels Cline, guitar; Dave Guy, Andy Bush, Carter Yasutake, Andy Gathercole, trumpet; Taylor Haskins, trumpet, valve trombone; Ray Mason, Mark Patterson, trombone, bass trombone; John Altieri, tuba; Donny McCaslin, tenor saxophone; Sam Sadigursky, tenor saxophone, piccolo flute, flute, alto flute, bass clarinet; Matt Bauder, alto, tenor saxophone; Jason Marshall, alto, baritone saxophone; Cochlea Gastelum, tenor, baritone saxophone; Charles Pillow, bass clarinet, alto flute; Ian Hendrickson-Smith, baritone saxophone; Jon Natchez, clarinet; Aaron Heick, tenor saxophone, English horn, bass flute; Sara Schoenbeck, bassoon; Pauline Kim, violin, viola; Mauro Durante, violin; Erik Friedlander, cello; Carolyn Leonhart, Jamie Leonhart, Milo Leonhart, vocals; Mauro Refosco, Leon Michels, Mauro Durante, percussion.